Do you feel stuck and getting nowhere? Do you feel like you have worked so hard and keep on working toward your goals, but sadly, you did not produce the result you want and failed to achieve your goal in the end? If this describes you, then you may find the answer in this article. When we talk about achieving great success in life, everyone wants to be part of it. After all, nobody wants to live in mediocrity and live in poverty. Everyone wants to be successful, be rich and able to live their dream life. However, studies have shown that as high as 80% of people fail to achieve their goals and reach their dreams. People know what they want; just that sometimes they may not be clear enough. And people work hard for it, but they did not stay on the course long enough to see the results. So you want success, you work for it, and you are not getting the result you want? Who tells you that to be successful you need to work hard? How can you work hard in the first place? You see, I’m a blogger and a writer, I cannot work hard. How do I work hard? Do I type harder on my keyboard? No, not at all. Most people have the wrong perception and think that to be successful, they need to work hard. And if they are not working hard enough, they can never achieve their goals. We can only work more, but we cannot work hard. Being a writer and writing is not hard work. If you work as a laborer in the construction site, what you do is hard work. Writing and facing the computer doing work is not hard work. That is the first point you need to understand. Second, working hard can sometimes make you unsuccessful! Yes, you read that right. Imagine your goal is to read a 500-page book. How are you going to read it? Are you going to read hard by spending 24 hours on it? If you do that, you will get suffer burnout and quit faster than you imagine. You cannot focus on doing one thing for a long period. Your mind will get distracted and try to look for something else to do. This is what causing most people loses their attention and momentum. When you get burnout, you will lose the momentum and lose the energy to move forward. You feel tired and exhausted that you want to get away from the work. Thus, hard work can be dangerous if you did not use it wisely. Third, the key to making it all work is to work consistently, working hard alone is not going to work. And it is so true. Success is a journey, and it is going to take time. You cannot force things most of the time. You just need to believe in the universe and work on your part. If you want a clearer idea on this, read my previous article, Law of Gestation. A human baby has a gestation period of about 280 days. And you cannot force that. The same goes in business and reaching your goals. Everything has a gestation period. If you want to lose weight, can you work hard in the gym and lose 10 pounds straight in just one session of workout? That is impossible. You will die of exhaustion in the gym before you lose all the fat. Everything takes time, and you have to understand that things will come to you eventually. You just need to believe and do your part. Unfortunately, most people would give up long before they get the results they want. They work hard in the first few days or weeks, and then they wonder why they did not receive the results they desire. The key is CONSISTENCY. You need to work on your goals and chase your dreams each day, consistently. Read the quote above three times. 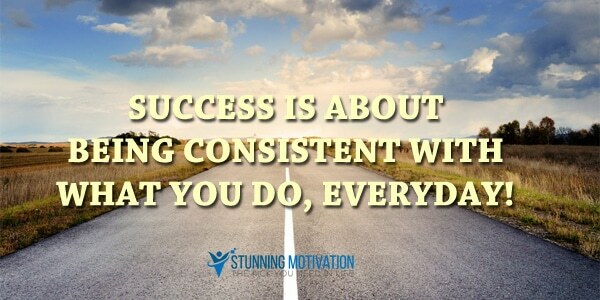 It is what you do consistently that will determine your success, not hard work. It is better to go to the gym for an hour every day than to hit the gym for 7 hours straight in one session. It is more effective to read 20 pages at a time for 15 days than to read an entire book in one go. You need to rest, and you need to relax. If you do everything and work hard on it, you will suffer burnout. Remember that. The final word on working hard – yes, you can work hard or work more if you want to, but never feel down whenever did not see the result you want. The key is going through the progress without loss of enthusiasm. This is why consistency always beat hard work. We are human, and there is only so much we can do in a day. Thus, make sure you take rest and do what is necessary. The second thing that may kill your success is to focus too much on the end results. When it comes to achieving remarkable success in life, most people will think about the results they want. For example, if you want to lose 10 pounds, that should not be your focus. Your focus should be on the progress; on your workout session in the gym. You should focus on creating a progress of making it to the gym for an hour a day. When you set your goal to lose 10 pounds by the end of the year, you will focus on the result and the deadline. If after 2 weeks and you see no changes on the scale, you will feel like a failure, and you will want to give up. This is why most people fail to reach their goals. They put all their energy and focus on the result and deadline. Here’s the key takeaway: Focus on the progress and develop a habit, not on the end result. Imagine if your goal is to become a successful blogger who has 100,000 unique readers to your blog each month, where should you start and what you should you do? Instead, you should focus on the progress, say; you will write and publish an article every Monday, Wednesday and Friday on your blog. You will request and submit for guest posts on other blogs every day, leave 3 comments each night before you sleep, etc. What do you think would happen after 2 years of consistent work? You will grow your blog and become an authority figure in your industry. Now, what is your initial goal? To build a successful blog with 100,000 unique readers a month, you will achieve the goal through the progress, not by thinking about the end goal or the deadline. 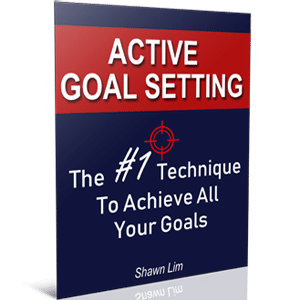 Focusing on the goal itself is not really going to help. You have to switch your focus onto the progress. When you focus on the result and the deadline, you will feel like a failure when you fail to create the result you want. Well, I’m not saying that you should dump goal setting altogether. What I’m saying is that you need to focus on the progress and build productive habits that will get you the result. Goal setting is still important because it reminds you of what you want and your direction. However, when you are not getting the result within the deadline, never feel dejected or failed. As long as you are progressing toward your goals, you are considered successful. By the way, do read this interesting article I wrote some time ago, How Do You Define Success. Hence, do you get it now? Stop chasing the result, instead, chase for progress and build a habit that will get you the result. Have you ever asked yourself this question? What do you truly want in life? When it comes to achieving success, most people will imagine driving luxury cars, travel first class, living in a big mansion, traveling to the world’s most exotic location, race camels and the Formula1 car in Abu Dhabi, etc. These are great people who have grand visions in life to serve and help and make people’s lives better in the world. Mark Zuckerberg did not wear fancy clothes; he is comfortable in jeans and a T-shirt most of the time. I don’t see Bill Gates put a thousand dollar suit on him. Here’s what you need to understand: There are 3 levels of motivation, happiness and satisfaction people are chasing for in life. This is what most people are looking for. They want to drive a better car, and they want to live in a bigger house. However, research has shown that these things cannot give you lasting happiness or motivation. I remembered I bought a fancy watch a few years ago. I felt great the moment I owned the watch, but the feeling did not last long, probably for a couple of weeks. After that, I don’t feel anything about the watch and just treat it like a normal one. I believe you have had this feeling too. When you first drive your car, you feel great about it. You wash it and wax it every week. What happens after a year? Most people would have lost the enthusiasm, and they never bother even if their car gets a scratch on the side. The same goes for your phone. When you first get your new phone, you protect it like your baby. You buy protective screens and put covers on it. After a while, your enthusiasm wane and you don’t really bother it that much anymore. This is what you need to understand – your motivation, happiness and feeling of satisfaction will never last forever if you chase for the next big shiny items. Passion is what makes people wake up early in the morning. It is what makes people stay later just to watch another episode or playing another round of games. We all know that passion is important, without it, you will never have the motivation to work for what you want. Well, the feeling you get from passion last longer than the shiny objects you chase in life. You can get driven, feel happier and more satisfied when you are working on your passion, but it cannot last long as well. I believe that there are times when your passion change and you don’t feel as passionate to do certain things, have you experience this? I used to be an extreme gamer when I was young. I played games from 9am to 3am, continuously during my school holidays. I’m so obsessed with it, and I just can’t stop playing the games. Fortunately, I’m not into gaming now. My passion has changed, and I’m into other things. I still play games once in a while, for fun and relaxation, not for the passion anymore. We often heard people said that passion is important, we should follow our passion or develop our passion in our work, and this is true. Why do you think Bill Gates and Warren Buffett were able to donate most of their wealth to the charities? And why do you think Elon Musk is so obsessed with creating an electric car? How about Jack Ma who wants to connect the world through e-commerce? They have a grand vision and a purpose bigger than themselves. They want to help and serve others and contribute to the world. This is the highest level of motivation, satisfaction and happiness we all should aim for. When you have a grand vision and a bigger purpose than yourself, you will have all the energy, motivation and drive to wake up early, work harder and stay later. You will be more committed because you are responsible not only for yourself but millions of other people. Jack Ma once said that he had the vision to build a borderless world that connects everyone through e-commerce. Where people from Argentina can buy cherries from people in the US and people from Alaska can sell their crabs to people in China. He sees the world without boundary and the world where everyone can buy and sell through the internet connection. And he said that he is constantly striving to achieve this vision. This is what makes him great. The same goes for other extraordinary leaders like Elon Musk, Richard Branson, Bill Gates, Larry Ellison, Nelson Mandela, Mahatma Gandi and much more. People want to join you and connect with you when you have a bold vision and a purpose bigger than yourself. And to discover your grand vision and a bigger purpose, you must connect with your inner self. You need to understand what you truly want to achieve in life. You have to be responsible and committed to it. More importantly, a grand vision can only be accomplished by a group of dedicated people. It is not easy and extremely challenging, but the drive, the motivation, the happiness and the satisfaction are totally worth it. You have learned the 3 levels of feelings that drive you in life. What you need to do right now is to find out what you truly want in life, by combining all the 3 levels of feelings. You must have some form of luxury objects to boost your motivation from time to time. You need to be passionate about your work to feel driven each day. And of course, you must create a grand vision and discover a purpose bigger than yourself to chase after. Most people stop at level 1, where they chase for the shiny objects. And some people reach level 2 and this is where they are so passionate about their work. Only a small group of people are driven by a vision and purpose to serving and helping others. What you need to do is to combine all three together to build the successful life you want. Like most people, I’m still improving and learning about success. I truly hope that you can be more successful and reach greater heights through what you have read here. So what do you think about this article? Do you this is helpful in your journey to success? Share your thinking with me in the comment section below. And if you like this article, remember to share to enlighten and motivate others too.